Exciting news! Today, a new capsule has been added to the HubTool: the map capsule! 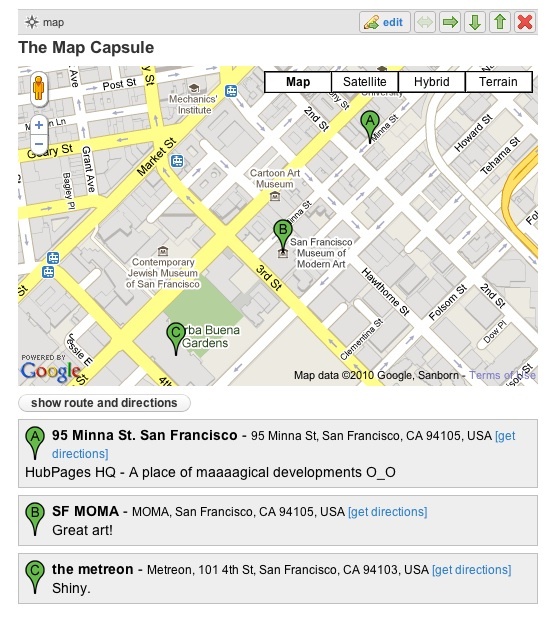 The map capsule will allow you to embed a map (or multiple maps) into your Hubs. On your map, you can mark and describe multiple locations of interest. The capsule itself has some really amazing features. For example, you can choose how your map is initially presented to readers- either in map, terrain, or satellite form. Readers can then switch settings up when visiting your Hub. Viewers can also (depending on the location) can click to view your location in Google Street View, meaning that they can walk along the very streets that you describe in your Hub. What’s more, readers can expand a drop-down set of directions to your listed locations via bicycle, walking, or driving. Pretty nifty, no? Honestly, the options for using it are endless! To learn how to use the map capsule and all of its lovely features, visit the Learning Center and read our guide. Then, take the capsule for a spin! You can go back and improve your old Hubs by adding this capsule, and perhaps this new feature has inspired you to write something entirely new. One final note: The map capsule was created by the brilliant Fawntia, who has utilized both her brilliance and endless patience (when dealing with our endless questions and development feedback) to create this fabulous tool. Fawntia, in my opinion, deserves a ginormous round of applause- and once you start playing with the map capsule, I’m sure you’ll agree! Thanks Fawntia, you are a great asset to Hubpages and you have added so much value and I look forward to using the new map capsule and it will work really well for the Geocaching treasure hunting game. Thanks again, now I need to get busy using this great tool. An added value indeed. Wonderful tool, I love it. This map capsule is a dream come true – adding a map without searching 100s of maps for free images. It is a sparkling addtion to my workforce and travel hubs so far and has many other uses that I will discover! Thank you HubPages and Fawntia! I like the idea of mapping out a pub crawl….I feel inspired now, just I won’t be creating the Hub until I’ve sobered up! Thanks, Simone. You have many great ideas for ways to use the map capsule, and I’m sure Hubbers will think of even more! This is brilliant! And timely. I was just about to write a bit of a travelogue, and was puzzling out how to show people exactly where a given location is, and along comes this map thingy. You guys are awesome. This will make a good use in my Travel hubs! This is a very good addition to Hub pages. this will be a very usefull to any user. Hope you will continue adding useful tools.